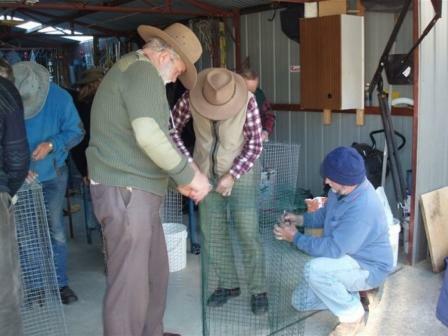 The Canberra Indian Myna Action Group Inc (CIMAG) is an example of how a self-initiated community-action group can have a profound effect on an environmental / amenity problem. The group was formed in April 2006 by bird-watchers / environmentalists in response to the high and rapidly-growing number of Indian Mynas in and around Canberra. While only introduced to Canberra in the 1960s – a hundred years after being taken to Melbourne market gardens – mynas had increased rapidly across all suburbs and were moving into the urban nature reserves. By 2006 they were the 3rd most abundant bird in Canberra, according to the data from the Canberra Ornithologist Group’s (COG) weekly Garden Bird Survey. The group was formed without any initial government funding. 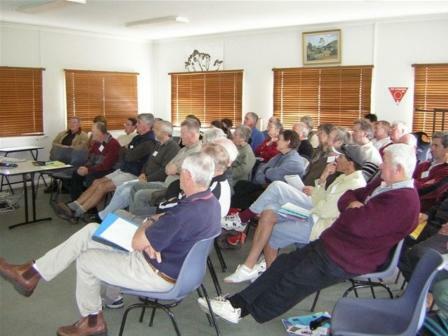 It proceeded to establish a presence and public profile through a public awareness campaign and the development of a network with key community and government stakeholders: the latter being, in particular, the RSPCA – ACT Office; environment officers of the ACT government; university researchers; and conservation-minded community groups. Public credibility is a key to public acceptance: with this in mind the CIMAG Committee was formed with high profile environmentalists. 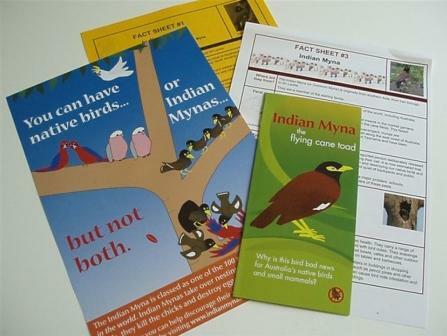 The community education and promotion program involved information sheets, media items (radio segments, TV and newspaper items), an informative website (www.indianmynaaction.org.au), newsletter (the Myna Matters Bulletin) and public presentations. While public education is important to community understanding and to group recruitment, the real practical control activity involves a humane trapping program. 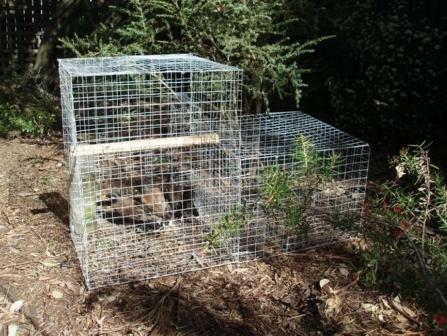 An important element to wide-scale backyard trapping is the ready availability of compact, easy-to-make and easy-to-use traps. The PeeGee trap was developed and fits this bill: it enables people to own and operate a simple but very effective trap in their backyard at very low cost. Traps, built at CIMAG working bees, are provided free to CIMAG members, although a donation is requested. Another essential element to a broad-scale community pest control program is a simple, humane and cheap means of dispatching trapped mynas. A Protocol on Animal Welfare, cleared by the RSPCA and to which CIMAG members commit, stipulates that disposal needs to be quick, painless and stress-free. People either take trapped birds to the RSPCA where, under an arrangement with CIMAG, they will dispatch the birds, or trappers will humanely dispose of the birds at home. CIMAG now has over 1330 members. Some 900 people on the monthly trapping database are known to have been trapping at some stage over the past three years. The simple-to-make trap has meant that other people have been making their own from our plans: the result is that CIMAG no longer knows the true number of mynas removed from the Canberra area. The program has been extremely effective: at least 38,300 mynas are recorded as having been removed from Canberra/Queanbeyan suburbs - the actual number is known to be considerably higher. The success of the program has given the movement credibility with both the public and with government: federal and ACT government grant funding over the past year has enabled the Group to expand its public education and trap building program, and to fund the Nowra Conference. The success of CIMAG’s community-action program is demonstrated by community feedback and by the annual COG Garden Bird Survey. From the 3rd most abundant bird before CIMAG started in 2006, mynas numbers have dropped every year to now be the 13th most abundant bird in Canberra. Community action can have a major environmental benefit.